Lunch: Soup and Sandwiches, dessert, drinks. Lunch will be provided by Community's United Methodist Men and will support the UMM Memorial Scholarship Fund. Brochure and print registration form. ​If you have questions, email Rev. Jason Stanley at jasonstanley@vaumc.org. The Rev. 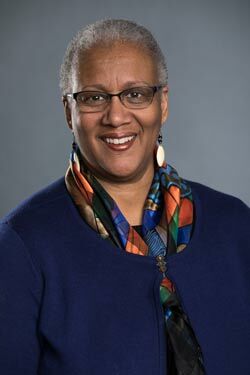 Dr. Jacqui King, an Elder of The United Methodist Church, ordained in the Texas Annual Conference, will be the plenary speaker and a workshop presenter. Known as a pioneer for connecting technology and faith community building by launching an online experience in 2007. Currently, she serves in Nashville, TN as the Director, Leadership for Congregational Vitality at Discipleship Ministries equipping leaders to lead effectively. She develops leadership resources for local congregations, engages network groups in new processes to implement core strategies, teaches clergy / laity in community development, designs and promotes online learning through webinars. She believes that education can create avenues for all to become empowered to live into their callings from the Lord. 1. Get Fresh: Fresh Expressions as Renewal for Existing Churches: DUE TO A CONFLICT, THIS WORKSHOP HAS BEEN CANCELLED. 2. How to Double Your Easter Attendance this Year: There are a few days throughout the year where God tends to send us more guests than usual. Easter is definitely one of them. But what if you could have twice the impact on Easter this year than you did last year? This workshop will give you ten practical ideas for growing your Easter services (plus a few bonuses!). (led by Rev. Brandon Robbins, Lynnhaven UMC). 3. Transactional & Transformational: How we have served God's mission locally and globally has focused primarily on actions that serve immediate needs of persons. That service still plays an important part of our lives as disciples. However, it should not stand-alone. How do we engage in the lives of those whom we serve so that true transformation takes place in their lives and ours? The workshop will consider one model (Open Table) of engaging with the poor and explore others. (led by Rev. Glenn Rowley, Virginia Conference Director of Mission & Global Justice). 4. What's Your Plan? Developing Discipleship Systems in Your Community: Most church leaders would like to see their communities become serious about making disciples. The problem is that disciple-making doesn't happen by accident. Disciple-making, as modeled by Jesus, requires intentionality, consistency, and defined expectations. This workshop is designed to encourage leaders and equip them with effective tools for developing discipleship systems in their communities. (led by Paulo Lopes, Virginia Conference Director of Next Generation Ministries). 9. Social Media & Youth Ministry: Twitter. Facebook. Instagram. Snapchat. If you don't know what those terms are, the youth in your church do. And they are using these social media tools. So are many or most of their parents and peers. This workshop explores the hows, whys, ifs and whens to use social media in youth ministry as a tool for sharing the Gospel with young people and their families. (led by Juliet Hutchens Leach, Digital Faith Formation). 10. What if We Boomers Reinvented 'Senior Adult Ministry' & Changed the Church? : Trends tell us that the Boomer generation aren't interested in traditional Older Adult Ministries. A huge number of Boomers are what we would call "unchurched," but may actually be very interested in spiritual matters in general. Rather than wait for churches to minister to us, what if we mentor our successors to spread the Gospel and make a difference in our communities? How we do that will be our legacy. If we do it well, wouldn't that change the church and the world? (led by Martha Stokes, Director, Church & Community Relations, Pinnacle Living). 1. Mission & Justice: What takes place at the intersection of the call to serve God's people in mission and addressing systemic injustice? This workshop will look at the biblical mandates as well as the historical United Methodist understanding of our theological and missiological tasks as well as our Social Prinicples. (led by Rev. Glen Rowley, Virginia Conference Director of Mission & Global Justice). 2. The Power of Team-Based Leadership: An Intro to Sustainable, Fruitful Organizational Development: We were never meant to lead alone. Jesus himself chose to invest deeply in the lives of a small group of people who went on to change the world. This workshop is designed to introduce participants to a team-based approach to ministry leadership, whereby our ministries can become effective and innovative. Participants will learn the basics of the L3 team development model: Loving, Learning, Leading. (led by Paulo Lopes, Virginia Conference Director of Next Gen Ministries). 4. 11 Tools for Stewardship: What would it mean to your ministries if you could receive a 5 or 10% increase in offerings? This workshop will provide a useful philosophy of stewardship, 11 key implementable tools, as well as additional resources to improve the stewardship of your congregation. Ideal for finance and stewardship leaders. (led by Rev. Jeff Witt, St. Andrew's UMC - VB). 5. 5 Reasons to Have a Child Protection Policy: This workshop will explore at least five reasons why churches should have and follow a Child Protection Policy. The workshop will also provide an overview of what should be included in your policy as well as reporting obligations. This is ideal for those who serve in children's and youth ministry, as well as Trustees. (led by Rev. Jason Stanley, District Coordaintor for Church Revitalization). 6. First Impressions: How to Create a WOW Experience: In addition to engaging a community, a church needs to be prepared to welcome guests. Before the worship service has even begun, first impressions are being made to first-time guests. This workshop will provide practical ideas to welcome and WOW first-time visitors. (led by Rev. Michelle Louk, Heritage UMC). 7. Everything You Need to Know About S/PPRC: The Staff-Pastor Parish Relations Committee is the administrative unit in the local church where staff and congregational interests are integrated to focus on the mission of the church. This workshop will explain who the committee is and is not, the four duties of the committee, five areas of focus, a calendar flow for meetings, and much more. Ideal for new and returning members of S/PPRC. (led by Rev. Wayne Snead, District Superintendent). 8. Who Are You? : Before you can successfully gather people to your church or ministry, you must first have an understanding of who you are. A clear vision communicates what the church is about. Our mission is to make disciples of Jesus Christ for the transformation of the world. But what is our vision? A church's vision is God-given and sees into the future, communicating how the church will make disciples. This workshop will explore the basics of discerning a vision and introduce participates to Korean churches whose innovative visions led to engaging the community in effective ways. (led by Rev. Won Lee, Ebenezer UMC). 9. The Art of Being Senior Friendly: The fastest growing age sector in the United States is older adults. Boosting safety and accessibility only helps senior adults connect with and stay involved. By removing barriers and providing congregational education and awareness that demonstrates understanding of older adults' needs, your ministries can help seniors enjoy fellowship with one another, be encouraged in their spiritual journeys, and continue contributing to the life of the church. (led by Martha Stokes, Director, Church & Community Relations, Pinnacle Living).